Trying to build a heroic rancor squad....any suggestions? Hey guys, i was think of building a rancor squad (i would get them to 7* gears 8-9 ) and I was wondering if you could help me build one. I was thinking teebo, bistan, rex, phasma, grand moff tarkin. Thoughts or improvements? P.S. i am free to play and can zeta soon but not consistently e.g. once a month. I solo with a first order squad..... Why not build one so you have something useful elsewhere in the game? Biggs lead, Wedge, CLS, Thrawn, and Raid Han. 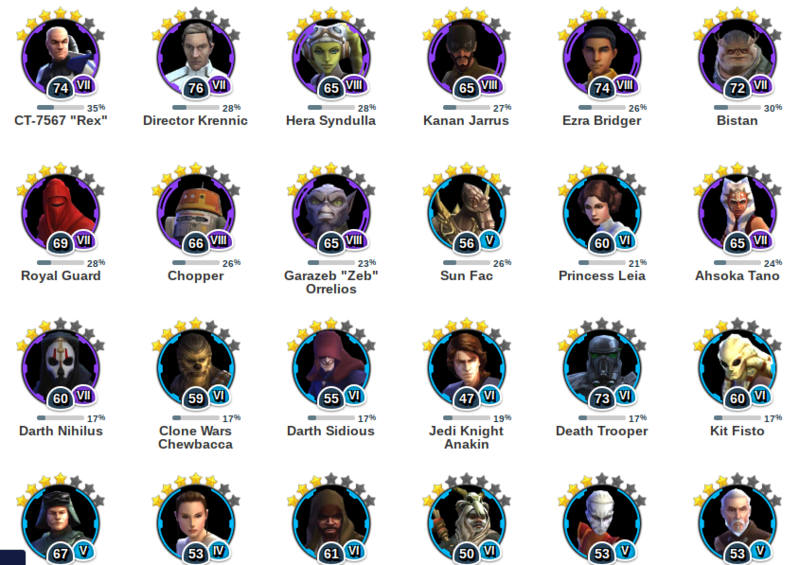 Need zetas on Raid Han, CLS, and Thrawn. You can auto with that team. FO is probably easiest but you're a long way from it, and can do really great damage in a really short period of time. zVader, Tarkin, Palp, TFP and one other TM remover (ideally Jyn who you don't have, or Teebo, or Bistan) but you'll need pretty high speed and great critical chance on TFP. You're pretty close to this team and just need a Zeta on Vader's lead. Teebo lead, Phasma and TFP as the core. Then add your two best TM removers (currently QGJ and soon Rex — GS until you get Rex). Phasma opens with VM to give advantage, which ensures a crit and tenacity down from TFP. Next turn Phasma applies speed down. After that save Phasmas VM for when Teebo needs the extra turn meter to move ahead of the Rancor or when Teebo is not stealthed. Mod TFP for crit chance. Mod Teebo for speed and Potency (just in case). TFP and Phasma should be slow. Teebo, QGJ and your third TM remover should be as fast as possible. It's slow. It's oldschool. It can't auto. But it's your best bet for your first solo. Oh, yes, bistan works as well. Any reliable turn meter remover. 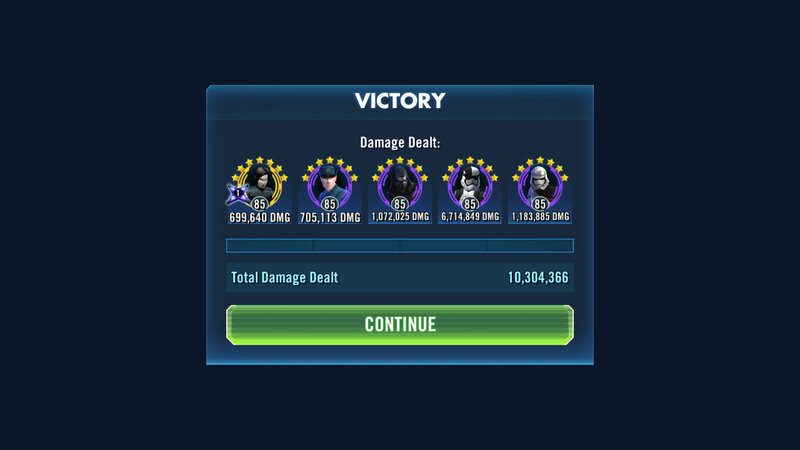 With one zeta I run Vader lead(zeta), tie pilot, Tarkin, Sidious, and thrawn. All G9 and I solo. Easy to play and easy to farm. Cheap to hear since it’s only g9 and only 1 zeta but it takes awhile to play and doesn’t sim (maybe with a higher gear level?). 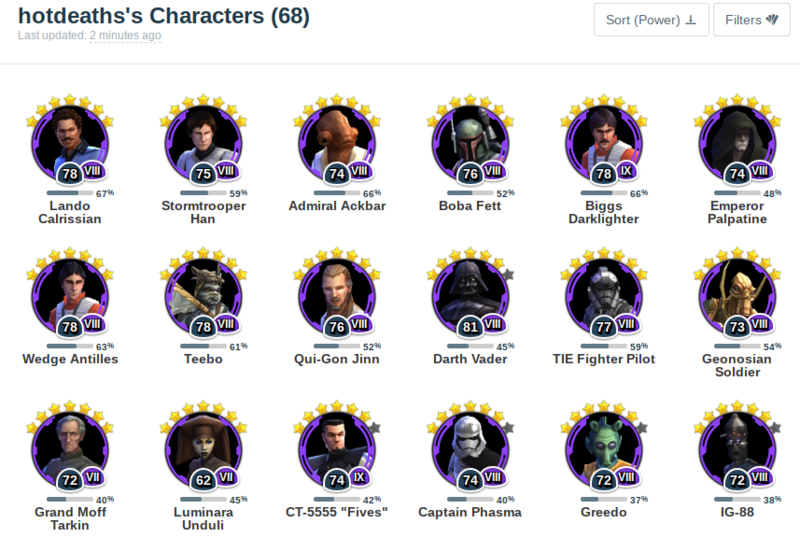 You probably need FOO for BB8 at some point - you could also look at something like Vader (L) / GMT / TFP / FOO and one of Rex / QGJ / Teebo as the last. Keep in mind that your results will vary at the level of those toons since character level plays some role in the potency vs. tenacity check.